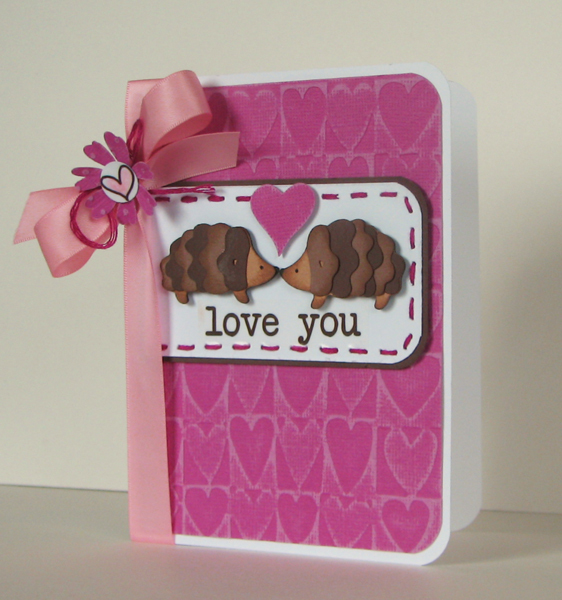 I created this card with the We've Got Your Sticker #53003 - Sweet sticker sheet. 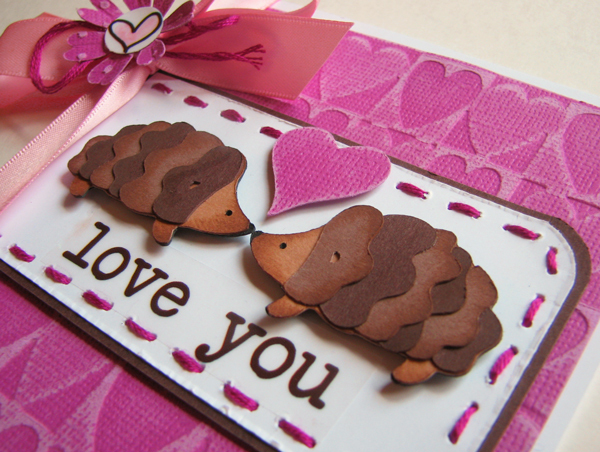 The hedgies were cut with my Cricut and Give A Hoot cartridge and the heart was cut with the Lyrical Letters cartridge. I also used my Cuttlebug and Heart Blocks embossing folder to emboss and sandpaper to distress the Core'dinations cardstock in the background. I would really appreciate it if you would hop on over to the SRM blog and leave a little love for me over there on my introduction post. ♥ While you are there, would you also consider signing up to follow the SRM blog?? You won't be sorry because there is always fresh and inspiring projects up all week long from a wonderfully talented design team. I want to show them how awesome my blog friends are because there is a little competition going on.......there is something in it for me, but there is also something in it for one of you. I will pick something in my HUGE stash of goodies to sent to one random participant......so, who wants to help out?? You just need to sign up as a follower over there and come back here to let me know that you are following the SRM Stickers blog on any post here. This is going to be so much fun because I know that you are all the BEST in my book!! ;) I will pick a winner from all participants on March 1st. Hi Amy, congrats on your new endeavor! I did go and welcome you on the new site, and signed up to be a follower. Thanks for sharing a new site. Love this card! Super cute! I went on SRM and am now a follower. TFS! What a cute card!!! I am now a follower of SRM. Just love all your designs! I've been following SRM (and you) for a while, and neither disappoint! Those hedgehogs are adorable! Thanks for all the cute ideas! I just signed up as a follower on the SRM Stickers blog! Congrats on the Design Team! I left your post over there some love & became a new follower of SRM. I really like how you've done the ribbon with the bow - so pretty!! Love love love it! So darn cute. And congrats on the new DT position! Hi, I just subscribed to the SRM blog. Love the hedgehogs! !